In the Artwork, People and Sales Component you’ll find the search icon in the top left-hand corner of the screen. Start typing in the search field and use the button provided or the return key to complete the search. From a Desktop device you can use the Keyboard shortcut of Cmd-F to enter the search field directly). 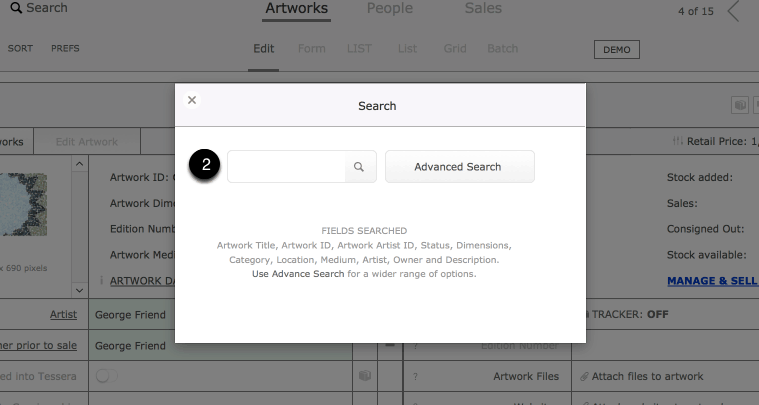 On the main screens of the Sales, People and Artwork components searching is conducted on “Main fields only” Details of which fields this includes are shown in the search dialog box. On the Advanced Search screen a wider range of search options become available. This includes the ability to enter search criteria into a number of fields at once. As well as options such as finding all artworks by a particular artist. The number of records found is displayed on the main screen in the top right-hand corner. Here two records has been found. 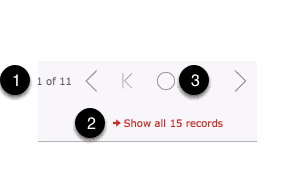 To regain access to all available records use the Show all button. 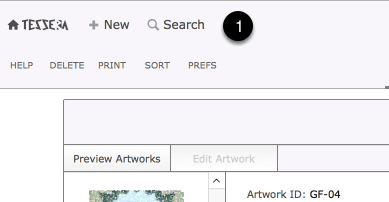 Use the Omit button to find the artworks not found with this search. For example: Search to find all artworks that are in the Category of “Painting”. Now use the “O” (Show Omitted button) and you are now viewing all artworks that are not in the Category of “Painting”.